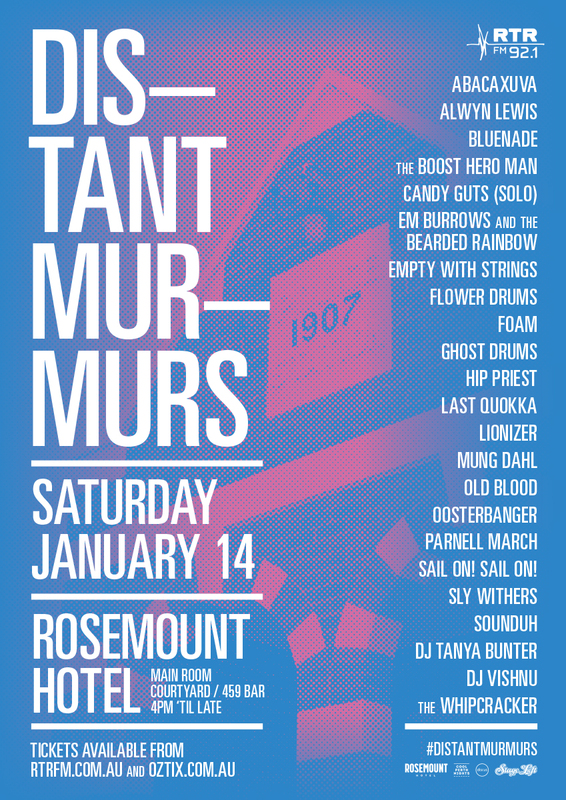 RTRFM’s local music festival Distant Murmurs returns to The Rosemount Hotel for its third year, with over 20 acts across three stages, boasting one of the most diverse line-ups of the year showcasing the present and future of Perth music. It all kicks off in the Rosemount Hotel Beer Garden from 4pm, featuring future-leaning R&B outfit Alwyn Lewis, cosmic beatmaker The Boost Hero Man, downbeat shoegaze newcomer Candy Guts (formerly Leashkid), master MC and instrumentalist Empty performing with a string quartet, a rare appearance from Perth expats Flower Drums, celestial experimentalist Ghost Drums, luscious synth-weaver Parnell March and garage electronica oddity Sounduh, plus DJ sets from Vishnu, Tanya Bunter and RTRFM legend The Whipcracker. In 459 it’s going to get loud, messy and sweaty with sets from indie punk trio Lionizer, raucous proto-punk quartets Hip Priest and Last Quokka, Catbrush frontwoman turned phenomenal blues machine Oosterbanger, and chaotic four-piece Sail On! Sail On! with a new album in tow. And in the Rosemount main room it’s an eclectic mix of blues, noise, indie rock and psychedelic soul with psych-noise fever dreamers ABACAXUVA, indie throwbacks Bluenade, local menaces FOAM, psychedelic soul enchanters Em Burrows and the Bearded Rainbow, low-key garage power-trio Mung Dahl, blues behemoths Old Blood and scrappy grunge throwbacks Sly Withers. Distant Murmurs is the best way to spend a summer Saturday afternoon, immersed in tunes from the present and future of Perth’s music landscape.